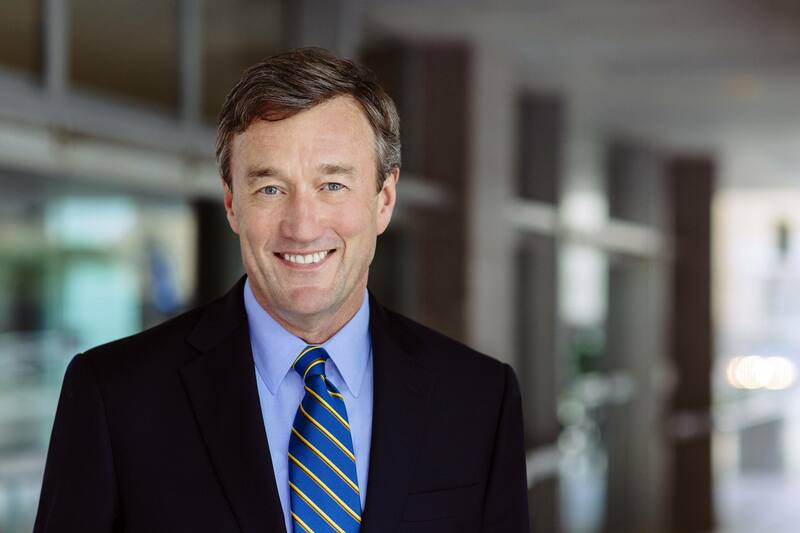 ROCHESTER, Minn. — John Noseworthy, M.D., president and CEO, Mayo Clinic, has announced he will serve another year at the request of the Mayo Clinic Board of Trustees. Dr. Noseworthy plans to retire from Mayo Clinic at the end of 2018. This decision comes after one of Mayo Clinic’s strongest years in terms of quality and safety; advancement in research, education and the clinical practice; and the completion of a $3.76 billion, eight-year philanthropic campaign. Dr. Noseworthy has been with Mayo Clinic for 28 years ─ nine as president and CEO. “Dr. Noseworthy’s inspirational and compassionate leadership has guided the organization from a group of separate clinics and hospitals to a single integrated organization focused on serving our patients,” says Jeff Bolton, vice president, Administration, Mayo Clinic. According to Di Piazza, Mayo Clinic has a long history of smooth and coordinated leadership transitions from the time of the Mayo brothers to today. Mayo Clinic’s president and CEO typically serves for eight to 10 years, staggered with the rotation of an administrative partner to provide strong and consistent direction, stability and a robust framework for succession planning. Mayo Clinic has an ongoing commitment and focus on developing a solid bench of succession candidates. “We would have welcomed Dr. Noseworthy serving even longer, but we respect his personal decision to retire and are confident in the strong pool of succession candidates,” Di Piazza says. In 2017, Mayo Clinic provided care for 1.3 million patients and advanced medical research and education, positioning the institution as a national leader in caring for patients with serious and complex health care needs. Mayo Clinic again was ranked the No. 1 hospital in the nation and No. 1 in more specialties than any other hospital by U.S. News & World Report. Mayo Clinic also took the No. 1 spot in Arizona, Florida and Minnesota, and in the Phoenix and Jacksonville, Florida, metro areas. For the first time, Mayo Clinic's Arizona campus ranked No. 20 among hospitals nationwide and is the first Arizona hospital to be named to the Honor Roll, which includes the Top 20 hospitals in the country. Fourteen Mayo Clinic hospitals received star ratings for overall hospital quality from the Centers for Medicare & Medicaid Services. Four earned the highest rating: 5 out of 5 stars. Seven earned 4 out of 5 stars, and three earned 3 out of 5stars ─ the national average. The star rating aims to provide patients and consumers with information about multiple dimensions of quality in a single score. The Mayo Clinic School of Medicine – Arizona Campus opened in July 2017 to an inaugural class of 50 first-year medical students. The cohort was chosen from more than 3,000 high-scoring applicants eager to be part of the medical school’s new campus. Mayo has one national medical school — with campuses in Arizona, Rochester and Jacksonville — sharing innovation in medical education with its students. Mayo Clinic School of Medicine advanced to a top 20 ranking in the U.S. News & World Report of 2018 rankings for Best Graduate Schools across the nation. Mayo Clinic School of Medicine and Mayo Clinic School of Health Sciences, two schools within Mayo Clinic College of Medicine and Science, are included on the list. In 2017, Mayo Clinic's Rochester campus began use of a new 7-Tesla MRI scanner, the first in North America cleared by the U.S. Food and Drug Administration (FDA) for clinical use in imaging the brain and knee. The ultrahigh magnetic field allows submillimeter resolution imaging to help arrive at patient diagnoses that have been elusive on less powerful MRI scanners. It also will open new avenues of research in epilepsy, multiple sclerosis, cerebral vascular disease and cartilage degeneration. At Mayo Clinic Hospital in Arizona, the FDA approved use of a cyclotron facility, paving the way for a sophisticated imaging agent to detect medical conditions at early stages. Patients have access to short-lived radiopharmaceuticals that more efficiently target disease. One of the drugs is Choline C-11, which provides the earliest FDA-approved imaging detection of prostate cancer possible. Other advances in cancer care included offering chimeric antigen receptor T-cell therapy (CAR T-cell therapy) to patients with B-cell non-Hodgkin lymphoma at the Rochester campus, which is one of 16 cancer centers nationally selected to provide the treatment. It’s a type of cell-based regenerative medicine. The process involves taking a patient's white blood cells, genetically changing a subset of them called T cells into CAR T cells, and infusing them back into the patient. The altered cells are better able to recognize and kill cancer cells. Total research and education funding in 2017 was more than $1 billion ─ $556.5 million in Mayo Clinic funding and $512.1 million from external sources. The National Institutes of Health (NIH) renewed one of Mayo Clinic’s largest government grants through 2022. The $48.8 million award from the NIH’s National Center for Advancing Translational Sciences supports researchers in translating discoveries to address unmet patient needs and supports efforts ranging from educational programs for researchers to community engagement efforts for research participants. Neurologic research progressed in using electrical stimulation of the brain and spinal cord to address paralysis, memory, epilepsy and stroke. A new transatlantic partnership was announced with Mayo Clinic, the University of Oxford and Oxford University Hospitals NHS Foundation Trust to underpin collaboration in patient care and medical research. Stem cell research included a rocket launch from NASA’s Kennedy Space Center of several samples of donated adult stem cells from a research laboratory at Mayo Clinic’s Florida campus. Phase one of Discovery Square began construction on Mayo Clinic’s Rochester campus in 2017. The 80,000 square-foot building will offer research space for Mayo scientists, and collaborating companies and organizations. Discovery Square is part of Destination Medical Center, the largest public-private partnership in Minnesota history, which is estimated to generate 30,000 jobs over the next 20 years. Mayo’s role in Discovery Square will focus on biomedical technology, products for regenerative therapies and advanced diagnostics. Mayo continues to share knowledge and provide virtual consultations to providers through an international network of independent organizations that are members of the Mayo Clinic Care Network. With two new members in 2017, the network has 45 members in the continental U.S., Mexico, Philippines, Singapore, the United Arab Emirates and China. These independent organizations represent 115 hospitals. 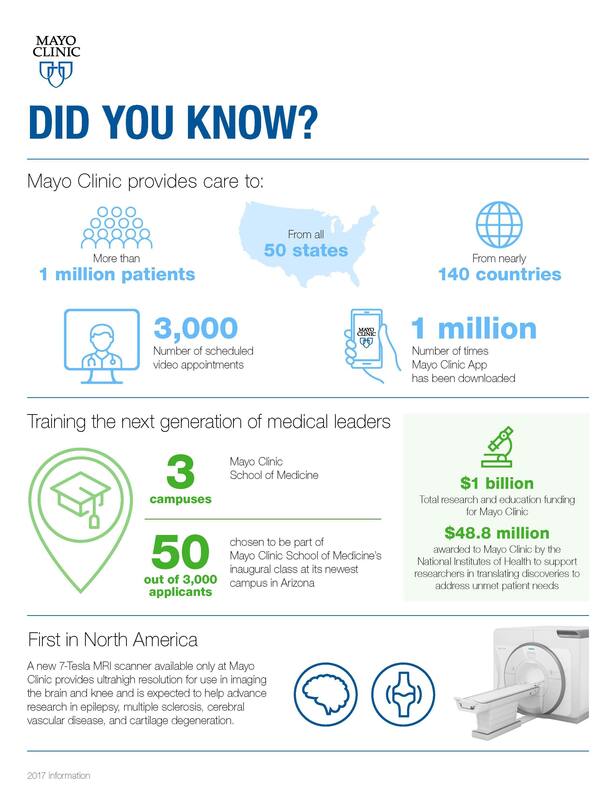 Through them, more than 12 million patients and their care teams have access to Mayo Clinic knowledge, clinical protocols and consultations. From Patient Online Services, with more than 1 million accounts, to the more than 3,000 scheduled video appointments, the Center for Connected Care continues to expand Mayo’s digital connection opportunities. The Mayo Clinic App, used by patients and nonpatients alike, has been downloaded by more than 1 million people. These downloads have led to more than 19,000 people requesting appointments at Mayo through app appointment requests. In 2017, Mayo Clinic contributed $11 million in cash and in-kind donations to local communities. Mayo Clinic community contributions support a broad spectrum of community needs across its sites, including social determinants of health, such as educational access; literacy; environmental stewardship; workforce development; and basic humanitarian needs, such as food and shelter. Mayo Clinic provided $1.25 million in support of relief needs in the aftermath of hurricanes Harvey, Irma and Maria. Southeast Minnesota: $4 million in support over two years for the Coalition for Rochester Area Housing to address local housing needs as a collaboration among the Rochester Area Foundation, Olmsted County and the city of Rochester; $325,000 in funding for permanent housing for 145 homeless youth and families at Gage East Apartments and the adjacent Empowerment Center’s job training and child care support in Rochester, Minn.; a $70,000 grant to Zumbro Valley Health Center, which provides integrated primary care, mental health, dental care and medication assistance to more than 250 underinsured residents in Olmsted, Fillmore and surrounding counties; $20,000 to National Vitality Center in Albert Lea to address chronic disease, mental health and other needs; $25,000 to Vision 20/20 to help businesses, non-profits, local government and educational institutions working together to improve quality of life in Austin. Southwest Minnesota: $20,000 in wellness programing at the Children’s Museum of Southern Minnesota and $5,000 for the BackPack Food Program to offer nutrition to schoolchildren during weekends and holiday breaks. Northwest Wisconsin: $201,000 in Hometown Health Grants for efforts to improve mental health, prevent obesity and reduce chronic disease in local schools, workplaces and neighborhoods; $250,000 five-year grant for the Confluence Arts Center in downtown Eau Claire. Southwest Wisconsin: Salary and benefits for a behavioral health specialist to work with high-risk youth and their families at the La Crosse Boys & Girls Club; a $10,000 donation for WAFER’s mobile food pantry to bring healthy nutrition to those dealing with food insecurity as well as transportation issues in La Crosse County. Mayo provided $575.4 million in care to people in need. This total includes $72.2 million in charity care, and $503.2 million in unpaid portions of Medicaid and other indigent care programs for people who are uninsured or underinsured. In addition, Mayo provided $1.9 billion in unpaid portions of Medicare and other senior programs. More than 53 percent of Mayo’s total medical services provided are for Medicare and Medicaid patients. As a tax-exempt nonprofit organization, Mayo is largely exempt from corporate income taxes. But Mayo pays taxes on parts of its operations. In 2017, Mayo Clinic accrued almost $70 million in income taxes; paid more than $80 million in MinnesotaCare taxes; remitted more than $10 million in sales and use tax; and paid more than $25 million in property taxes, contributing significantly to the economy. Mayo Clinic reported a strong financial position in 2017, with $707 million in income from current activities committed to mission-advancing projects. Salaries and benefits for Mayo staff totaled $7.3 billion, or 65 percent of expenses, and $535 million was contributed to the staff pension plan. Investment of $714 million in capital projects included implementation of a single, integrated electronic health record and revenue cycle management. The project aims to enhance services, accelerate innovation and enable Mayo Clinic to provide better care for patients. Starting in 2017 at Mayo Clinic Health System sites in Minnesota and Wisconsin, the project continues at Mayo’s campuses in Arizona, Florida and Rochester in 2018. Other capital expenditures in 2017 included work on a destination medical center building on the Florida campus, which will be called the Dorothy J. and Harry T. Mangurian Jr. Building in honor of a $20 million gift from The Harry T. Mangurian Jr. Foundation in Fort Lauderdale, Florida. This gift will further enhance Mayo’s integrated services for complex cancer, as well as neurologic and neurosurgical care. State-of-the art facilities upgrades included operating room expansion and inpatient projects in Rochester. These efforts reinforce Mayo Clinic’s level of commitment to the Destination Medical Center initiative by enhancing the patient experience and positioning Mayo Clinic as the premiere global destination for health and wellness. Across Mayo Clinic Health System, expansion and renovation projects in Mankato, Minnesota, included $65 million for a hospital surgical suite expansion and an additional $5 million in the orthopedic and sports medicine area. In Fairmont, Minnesota, a $4.5 million Emergency Department renovation project was completed. In Albert Lea, Minnesota, a $720,000 investment is helping remodel the Cancer Center, in collaboration with Naeve Health Care Foundation and community donors. And work has begun on a $2.75 million cooling plant, paving the way for future renovations and expansions. There are plans to add four floors for a total of five to Mayo Building South and remodel existing space in the Davis Building. The $70.5 million project will provide space for cardiovascular, cardiology and cardio-thoracic surgery program areas; spine center and pain rehabilitation programs; surgical rooms; molecular imaging center for radiology; and laboratory expansion. Completion is expected in 2019. Three floors will be added to the Generose Building on Mayo Clinic Hospital – Rochester, Saint Marys Campus. In addition, the East Tower will be completed, enhancing inpatient and therapy space, and modernizing the neonatal, pediatric and cardiovascular disease ICUs. The $217 million project will be completed over five years. There are plans to expand and renovate the Cancer Center. This includes the departments of Hematology/Oncology and Radiation Oncology. The $4.9-million project also will create space for support services, such as dietetics, social work and palliative care. Completion is expected in 2019. Mayo has long understood the need to scale its innovation for broad application. In 2017, for example, Mayo and artificial intelligence firm, nference, launched a start-up company for drug development that will be powered by clinical expertise and artificial intelligence. The company, Qrativ, seeks to discover lifesaving treatments and identify all possible uses for drugs at their early phases of development. Revenue from commercialization efforts, which is managed by Mayo Clinic Ventures, created gross revenue of $66 million in 2017 to support patient care, education and research. To find out more about Mayo Clinic’s economic and societal impact, refer to Remarkable Moments of Sharing. This report shows Mayo’s national economic force, detailing benefits to households, businesses, government and other organizations. Through integration of clinical care, research and education, Mayo creates connections that lead to a meaningful effect on patients, researchers, medical students and communities. Mayo Clinic finished 2017 with $707 million in income from current activities — or net operating income — which translates to an operating margin of 5.9 percent. All of Mayo Clinic’s income is reinvested in its practice, research and education missions. Revenues grew by 9 percent to $12 billion. Benefactors, primarily grateful patients, contributed $423.8 million to fund Mayo Clinic programs in practice, research and education. Additionally, benefactors provided $210.2 million in future commitments, which will support Mayo’s mission in the years ahead. Mayo Clinic contributed $535 million into the staff pension plan in 2017 as a continued commitment to staff. Total research and education funding in 2017 was more than $1 billion — $556.5 million in Mayo Clinic funding and $512.1 million from external sources. Mayo Clinic capital expenditures were $714 million in 2017. These expenditures are part of a multiyear plan to continue to invest in equipment, facilities and technology, including a new electronic health record and revenue cycle management system, network infrastructure and security upgrades.